Since the rumor of a mega-long extension of Joey Votto’s contract was confirmed on Monday, the internet tubes have been clogged full of trucks carrying people’s responses, opinions, and analysis of the proposed deal. The Cincinnati Reds have yet to announce the deal, but a press conference to address it has been announced for Wednesday. How are Reds’ bloggers handling the unexpected, wonderful news? I’m not prepared to—nor do I want to—consider the sheer magnitude of this deal or how its ramifications could affect a small-market team like the Reds and their signings down the road. Let’s not do that, okay? You guys (myself included) wanted the Reds to pay Joey Votto and keep him in Cincinnati for a long time. The Reds did that. We’re not allowed to complain. Blockbuster deals like this don’t happen to the Cincinnati Reds—ever—so enjoy it. The Votto contract is roughly in line with comparable signings. The most remarkable aspect was that the agreement was reached two seasons before Votto’s free agency, which is virtually unique among the comparison contracts. Only the much-shorter Howard deal was equal in that regard. 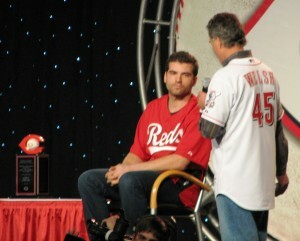 Votto negotiated only with the Reds; he was not engaged in a bidding war like those exploited by Fielder and Pujols. The Reds must have felt these terms were better than ones they could have reached a year or two from now. The numbers can project what Joey Votto is going to be worth over the life of this contract, and how much every dollar paid to him is worth in free market wins available, but in this rare instance they utterly fail at fully understanding the real value of Joey Votto the Red. This has been one of the league’s most moribund, dysfunctional, impotent, and inconsequential franchises for a number of years. Most will shake their fists at past ownership groups and management teams who failed to develop resources and squandered what few were available. Most will also point fingers at a league that allows for such unbalanced distribution of resources. Not only did the Yankees develop a rare talent like Derek Jeter, but when he approached free agency there was never a question that he would be re-signed. This winter, with two years before scheduled free agency, Votto was one of the most talked-about impending free agents. The Reds could never afford a talent like his, not in a market like this. The established, traditional media weighed in, too. When they said the Cincinnati Reds couldn’t sign Joey Votto, they came up with millions of reason to say they can get it done. That’s the figure being thrown around that the Reds are offering Votto — $225 million for 10 years. And Reds CEO Bob Castellini can light up one of his Liga Privada No. 9s and take a deep, deep bow. If this doesn’t show fans that the Reds are dedicated to putting the best possible team on the field for now and for the future, then nothing will. –The club is convinced its revenue stream will increase. A Reds insider told me as much. Part of that comes from national television, part of MLB other new media revenue sources. –The club is convinced that it will be to get a new local deal with Fox Sports Ohio before the current one expires in 2016. The Reds won’t be getting anywhere near with the Angels and Rangers got. But, say they get a $10 million a year bump, that covers the difference between Votto’s salary this year ($11 million) and what he’s getting when the 10-year, $225 million extension kicks in. Was it risky to agree to such a huge deal? Certainly. Votto isn’t likely to be the same player at 38 as he is at 28. But he takes great care of himself. He plays a position that is less taxing than outfield or the middle infield. But it would have been just as risky to let Votto walk. The current ownership is trying to rebuild credibility with the long-suffering fan base. It’s hard to do that when you let your best player walk. Overall, the reaction has been very positive. Once the final numbers are released, there will be time for in-depth examination of who got the better end of the deal, but right now, it feels like the Reds fans did. I’m confident the Castellini ownership group is not going to make the mistakes of the past. Votto is going to take up a large percentage of the team’s payroll, like Ken Griffey Jr once did, but Castellini has demonstrated he’s smart enough to realize it takes more than one slugger to win. The Reds now have an exciting young core locked up for several years to come–more than just Joey Votto–and I am even more excited about wearing my Votto jersey to games than I’ve ever been before.